A Place of Sanctuary...and a Place of Rest. The mission of Glastonbury Abbey is to be a Benedictine presence for the Church and to the people of the greater Boston area of New England. We have a large extended Community of people who regularly worship with you and find the Abbey Church and grounds to be a place of sanctuary. Recently, a new venture has been undertaken by the Abbey and a group of interested individuals within the extended community who responded to some "grass-roots" inquiries and suggestions. This group, with representation from the monks, now forms the Columbarium at Glastonbury Abbey (CGA). Their efforts and the support of the monks has resulted in the construction of a Columbarium on the Abbey grounds near the Monastic cemetery. The Columbarium at Glastonbury Abbey is pleased to offer the extended Glastonbury Abbey community the opportunity for burial after cremation. 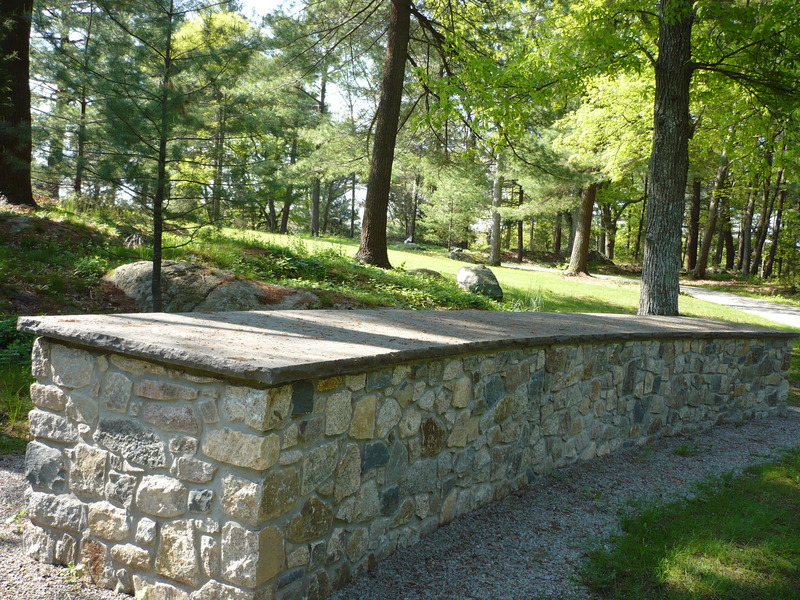 The columbarium, pictured below, is designed as a low stone wall set in an alcove near the monastic cemetery. The CGA will oversee the overall process, from application approval through the memorializing, placement and perpetual care of the created remains. A brochure (in PDF format) is available by clicking here. Brochures are also available at the Abbey. The brochure is a tri-fold that contains the initial application. You may purchase a niche(s) for cremated remains which are to be interred in the columbarium. Each niche is a discrete chamber designed, constructed and intended for use as a permanent entombment of cremated remains. All cremation or funeral arrangements are to be made and completed by the family prior to cremains being interred in the columbarium. A staff member from the CGA office will work with the family to schedule a time for interment, which involves opening and closing the niche. Access is dependent on weather conditions and may be closed during the winter months. The family is responsible for arranging any accompanying service and for cremains to the entombment. The cremains will be in an urn or another suitable container that will fit in a 24" deep by 14" x 13" niche. The capstone will be engraved in a standard format. The cost of the engraving is the responsibility of the family. No other ornamentation is permitted on top of or around the columbarium. A Niche Purchase Agreement enables two non-related persons to sign. The Purchase Agreement, Deed, and CGA Policies and Definitions are available by contacting the CGA Office at (781)749-2155, extension 371. A right-of-way clause is included in the Deed to ensure continuing access to the columbarium. The cost of each niche is $3000. There will be an additional cost of $500 each time the niche is opened and closed. This fee will help defray costs for perpetual care. Entombment shall be permitted in any available niche only upon receipt of full payment. The first module of 34 niches is now complete. The second module of niches will be contingent upon demand.